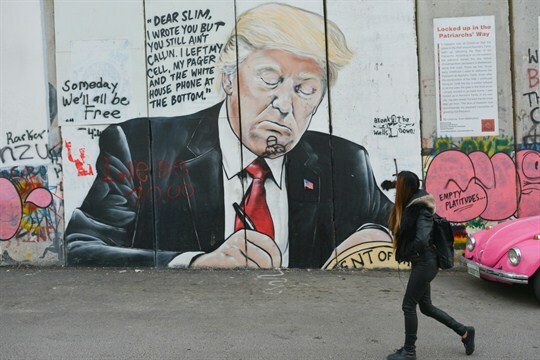 A girl walks by a mural of Donald Trump drawn on Israel’s separation barrier Bethlehem, West Bank, March 13, 2018 (Sipa photo by Artur Widak via AP). On March 24, a bill requiring the U.S. government to cut financial aid to the Palestinian Authority quietly passed into law as part of the omnibus spending bill signed by President Donald Trump. The new law, known as the Taylor Force Act, is the latest in a series of punitive measures taken by Washington against the Palestinians that are casting a shadow over their bilateral relationship and threatening stability in the Middle East.